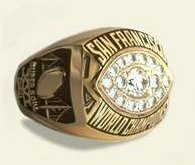 The design of the ring symbolizing the 49ers' Cinderella season is based on that of an earlier Cinderella team, the Super Bowl III champion New York Jets. However, there are some significant differences. The area where the Jets' ring had a football-shaped green background stone was replaced in the 49ers' design with diamonds. Overall, each 49ers ring has more than two carats of diamonds, including the central 90-point diamond. The ring is made of 10k gold and weighs 30 pennyweight. One shank features a football super-imposed on the Golden Gate Bridge, the Super Bowl XVI logotype, and the game's score. The other shank has each player's name in raised letters at the top, the initials "S.F.," and a San Francisco helmet. The ring was designed by L.G. Balfour.